At Albergo Bianchi, from 7 to 9.30 in two large halls recently restored, the staff will serve you with every kind of hot drink (coffee, American coffee, Cappucino, malt coffee, hot chocolate, milk, various teas, etc.) freshly prepared, that you could wish for. Our buffet including bread, pastries, rusks, butter, assorted jams, honey, fruit juices, cereals, yoghurts, and anything else we can offer our guests as part of a continental breakfast. Other items such as eggs, cheeses, various sliced meats are considered as extras. Breakfast may also be ordered in the room where the service will be brought on a tray. The traditional Mantovan lunch, which is accompanied from start to finish by a vast array of traditional breads of various forms, begins with a taste of grépole (pork scratchings), or polenta and gras pistà (slices of grilled polenta, with ground lard and topped with parsley and garlic) and exquisite cured meats, particularly Mantovan salami, with its special aroma of garlic; accompanied by seasonal melon. Among the typical Mantovan produce, it is worth remembering the chisolìna (small crisp cakes produced by bakers). To follow are the delicious, aromatic soups, of which the agnolini (puff pastry filled with various braised and minced meats) are the most well-known and expressive, such as the fine tagliatelle in meat broth or maltagliati in farmhouse minestrone with beans. Puff pastry is also used in the wonderful foiade col nèdar o col pisùn (fettuccini with duck or pigeon sauce) or pappardelle with game sauce (hare, pheasant). 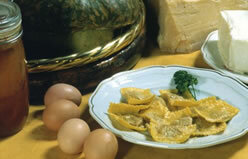 Among the filled pasta, pumpkin tortelli, unmistakable for its harmony of sweet-savoury taste, draws on the tradition of lean eating, but today are an emblem of Mantovan cuisine. Also noteworthy are the pastas prepared by pressing, such as maccheroni with bacon and beans or with stewed donkey-meat sauce and the bìgoi con sardèle (spaghetti specially served with sardines or salted anchovies, melted in oil). Exclusiveness however is represented by the risottos, also thanks to the typical production of dwarf vialone rice within the territory of Mincio, the most famous of which is cooked “by pilot”, that is according to the ancient rice huskers, served with pork pesto and accompanied by pontèl; stewed leg or rack of pork. But, of a unique exquisiteness are also the risottos with the “fruits” of the paddyfield; with catfish, carp, tench, psina (small, freshwater fish, well-fried and crisp) or with saltarèi (moat shrimps), or with frogs and snails. 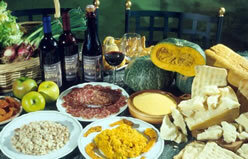 Of the main dishes syou can choose from farmyard animals, generally roasted, and pork served in different ways, where the typoical boiled sausage is distinguished by its mouth-watering taste, but tradition principally proposes donkey or horse-meat stew, accompanied by yellow smoked polenta in a vegetable sauce and by red wine. Tradition, the fruit of the particular lacustrian environment, is however represented especially by the inviting pike in sauce, boiled and served with chopped capers, anchovies, peppers and parsley, or with garlic, parmesan and lemon, and served with grilled polenta. After this variety of tastes, you should not miss tasting some of the optimum varieties of parmesan cheese. Of the many sweets, from the baker and the cake maker, the Sbrisolona cake stands out; made with yellow flour, almonds and lard, as well as the Anello di Monaco, a sweet risen and filled, and the Torta di Tagliatelle. To crown the meal are the wines, particularly the excellent Cabernet, Merlot, Rubino reds, and the Chardonnay, Tocaj, Pinot, Riesling whites, produced as fine wines of Alto Mincio and Colli Morenici Mantovani del Garda. Absolutely not to be missed is the quality Lambrusco Mantovano Doc wine, produced in the areas of Viadanese-Sabbionetana and beyond the River Po.